Just when people and pundits had been saying that the Climate and Energy bill traveling through the Senate wouldn’t get anywhere near the attention that the Dems’ pet Health Bill received, the Gulf Oil Gusher, our nation’s worst environmental disaster to date, hit. The terrible upside to disasters is that they spotlight disastrous situations and systemic failures and weak links. Meeting this past Thursday in Washington D.C., California Governor Arnold Schwarzenegger spoke with Henry A. Waxman, co-author of the Waxman-Markey Bill who also chairs the House Energy and Commerce Committee (D-California) and also U.S. Department of Health and Human Services Secretary Kathleen Sebelius. 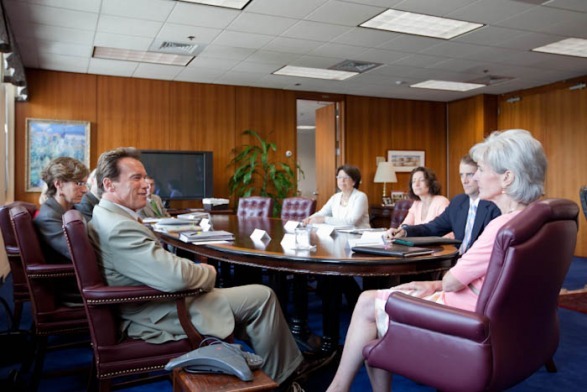 Schwarzenegger and Sebelius in D.C. Photo Courtesy Justin Short. Filed under Clean Air Act, Climate and Energy Bill, Governor Schwarzenegger, Greening D.C., Gulf Oil Disaster, Henry Waxman, Kathleen Sebelius, Murkowski Bill, U.S. EPA, Waman Markey Bill, Washington D.C.
To the left of Senator Pavley, author of AB 32, in the photo sits Mary Nichols, chair of the California Air Resources Board. On the right is Linda Adams, secretary of the California Environmental Protection Agency. Linda Adams, former director of the California Department of Water Resources, was appointed by Governor Arnold Schwarzenegger in May 2006 as Secretary of the California Environmental Protection Agency – making her the first woman to serve as head of the agency. As you probably have heard by now, there is a battle brewing to delay California’s clean energy and air pollution control standards. And we need your support. California’s climate change law, AB 32, the law that forever changed the rules on clean air, holds polluters accountable and requires them to reduce air pollution that threatens our health and our environment. AB 32 has moved California into the forefront of clean technology by creating opportunities for Californians to innovate and create new ways of protecting our environment and creating green jobs. Because of leaders like you, AB 32 has created thousands of jobs, motivated an emerging economy and inspired businesses to partner with environmentalists. However, what is most important is that AB 32 has changed the way Californians think about clean energy and how we affect our environment. We know that this is a global problem that requires a global solution. But change must start here with us, at the grassroots level. From here, it works its way up through our nations and around the world. Any signal of delay could be disastrous for a national commitment to reducing pollution. Those who are attempting to delay our move to a clean energy economy maintain it will only “suspend” AB 32’s pollution and health requirements until the economy gets better. Well, we’re all waiting for the economy to get better, but in the meantime, suspending a law that has increased jobs, investments, innovation and public consciousness does not serve the people of California. Join me in supporting AB 32 and the state’s commitment to growing clean energy businesses and technologies by signing up on-line today. Your help will not only support our growing green economy, but will also help California for a better tomorrow.